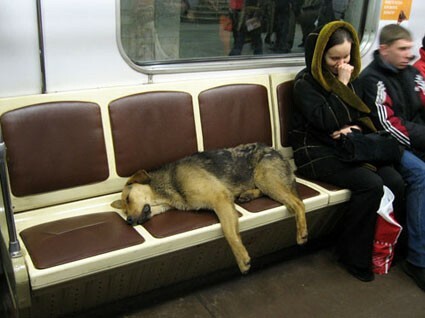 Stray dogs of Moscow are the smartest. These pups are the real deal, taking the train into downtown day after day, constantly demonstrating new ways to scare shwarma out of the hands of passersby. Regular Moscow busy street with some small food kiosks. A middle-aged man buys himself a piece of hot fast food and walks aside chewing it without a rush. Then just in a second he jumps up frightened - some doggy has sneaked up on him and barked out loudly. His tasty snack falls out from his hands down to the ground and the dog gets it. Just ten minutes later, on the same place, the teen youngster loses his dinner in exactly the same manner. 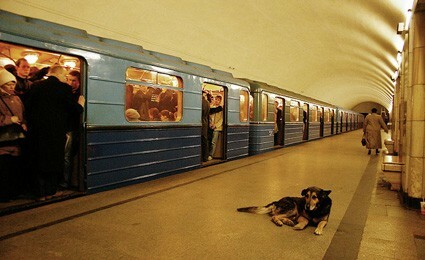 The modern Russian dogs are on their urban hunt. 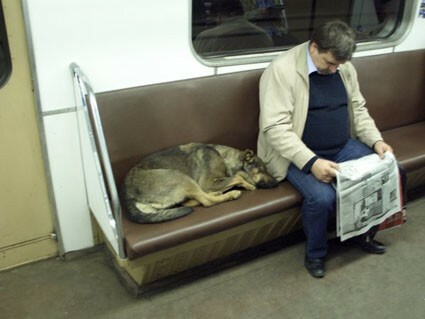 Moscow ecologists think that dogs started acquiring this habits in 1990s, when the Soviet Union collapsed and Moscow has fell into the hands of new class of Russian capitalists. They understood the true value of the downtown realty underestimated by previous Communist owners and became removing all the industrial complexes Moscow had in its centre to its outskirts. 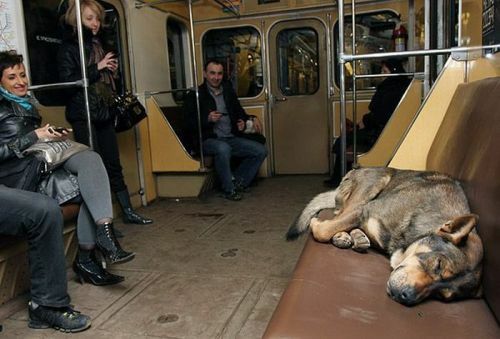 Those places were used by homeless dogs as a shelter often, so the dogs had to move together with their houses, so they had to learn how to travel Moscow subway - first to get to the centre in the morning then back home in the evening, just as us people. The commercial revolution of Moscow made their usual feeding places like trash bins out of direct reach, so they had to get to know new ways of getting their piece of food. That’s how appeared those “Shawarma hunts”. Sometimes though they use more gentle methods. Young girl sits on the bench to eat her hot dog - a big cute looking dog appears from the surrounding bushes and puts her head on her knees. The girl can’t help herself sharing the hotdog with a dog. 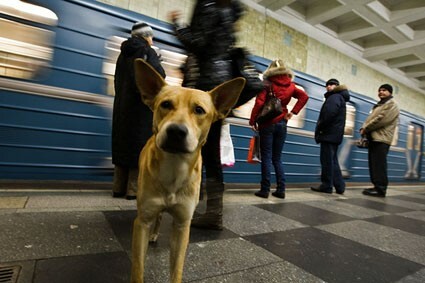 Among some more amazing skill those Moscow dogs are the ability not to miss their stop while going on the subway train. 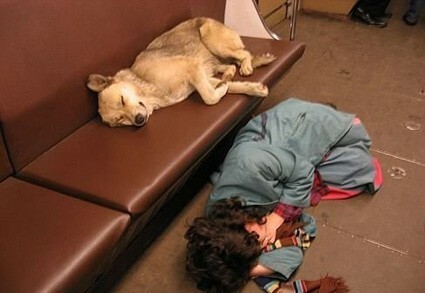 Biologists say dogs have very nice sense of time which helps them not to miss their destination. Another skill they have is to cross the road on the green traffic light. “They don’t react on color, but on the picture they see on the traffic light”, Moscow scientist tells. Also they choose often the last or the first metro car - those are less crowded usually.